large format digital print category. A delighted Tara Wilson-Black & Philip A. 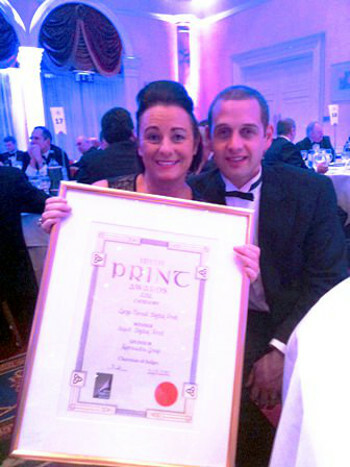 Black with their sixth Irish Print Award Dublin based Select Digital Print scooped a ‘back to back’ award at last nights Irish Print Awards 2012 which were held in the Clyde Court Hotel, Dublin 4 (29th November). The company was defending its 2011 win in the Large Format Digital Print Category and through to form, delivered the goods on the night. This annual event is the print industry’s accolade to the best of Irish Print across all sectors and is highly coveted by those companies that win. “Select Digital Print was awarded their sixth Irish Print Award last night at the Irish Print Awards ceremony which honours the best of Ireland's print industry. The company won the Large Format Digital Print category after receiving 4 nominations for the 2012 Awards. Although all sections of print and design were honoured at the award ceremony the following will be of particular interest to our readers.